I love seeing what people can do with Minecraft. From starships to functional processors, it shows the power and ingenuity of people when given a practically unlimited environment. This latest one is right up there with my all-time favorites, as a fully functional "hard drive" that can hold up to 1KB. There's even a semi-detailed explanation for how it works, and plenty of screens and gifs here. A few of the better bits have been included below. Here's the view of the entire drive. 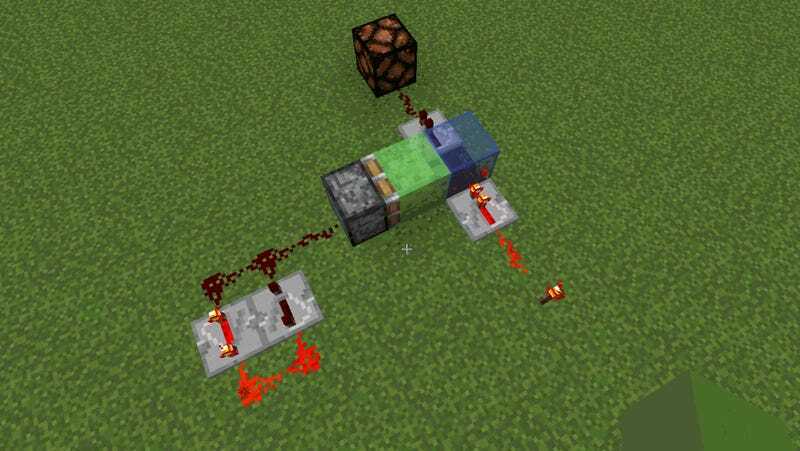 It works because redstone, a material in Minecraft, can carry signals in much the same way as electrical wire. More importantly, redstone signals propagate only through opaque blocks. By using a piston to switch between the two, Minecraft players can use redstone to recreate binary – the language of computers. Unfortunately the drive has to be operated manually. Pulling enough data to represent one letter would take 0.8 seconds, which is almost a billion times slower than a real hard drive. You won't be playing games on this anytime soon, but it's still really cool, yeah?